Book 1: Indian Boundary in the Southern colonies 1763-1775. Author: De Vorsey. Book 2: Advancing South. Author: Mims. Book 3: Tennessee Yeomen 1840. Author:Clark. Book 4: When Yesterday Was Today. Author: Blankenship. Book 5: Uneven Yoke. Author: Blankenship. Book 6: Volunteer Forty Niners. Author: Durham. Book 7: Southwest Territory 1790-1796. Author: Durham. Book 8: Loot. Author: Alexander. Book 9: Durham; City of the New South. Author: Boyd. Book 10: Handicrafts of the Southern Highlands. Author: Eaton. Book 11: Civil War Drawings from the Tenn. State Mus. Author: Kelly. Book. 12: Touring Tennessee. Author: Wills. Book 13: Touring Tennessee (second copy). Author: Wills. 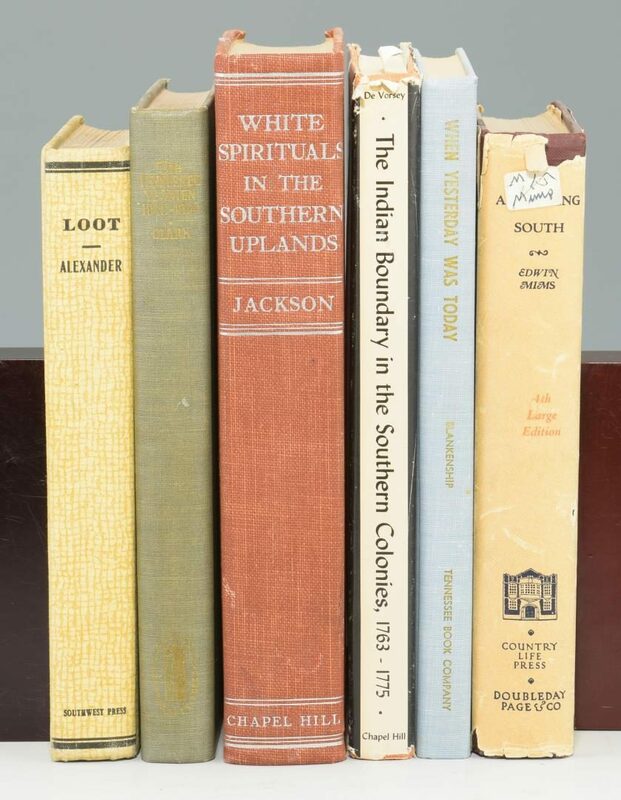 Book 14: White Spirituals in the Southern Uplands. Author: Jackson. 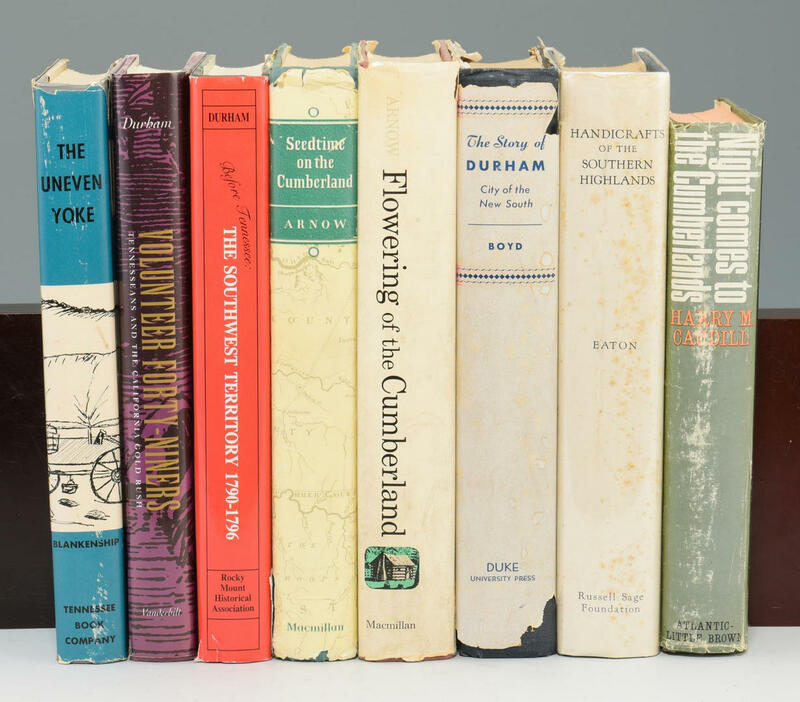 Book 15: Flowering of the Cumberland. Author: Arnow. Book 16: Seedtime on the Cumberland. Author: Arnow. Book 17: Night Comes to the Cumberlands. Author: Caudill. 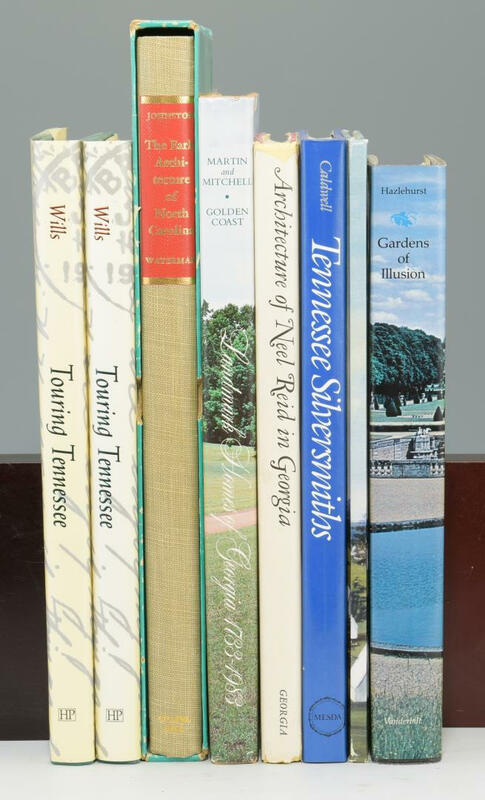 Book 18: Tennessee Silversmiths. Author: Caldwell. Book 19: Architecture of Neel Reid in Georgia. Author: Grady. Book 20: Gardens of Illusion. Author: Hazlehurst. Book 21: Architecture of North Carolina. Author: Johnston. 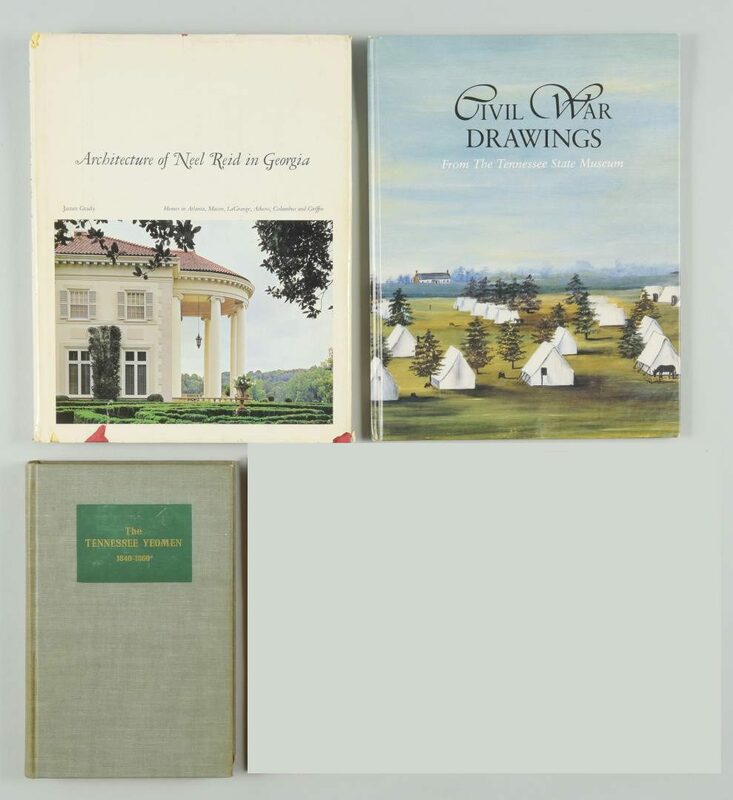 Book 22: Landmarks Homes of Georgia 1733-1983. Author: Martin and Mitchell. 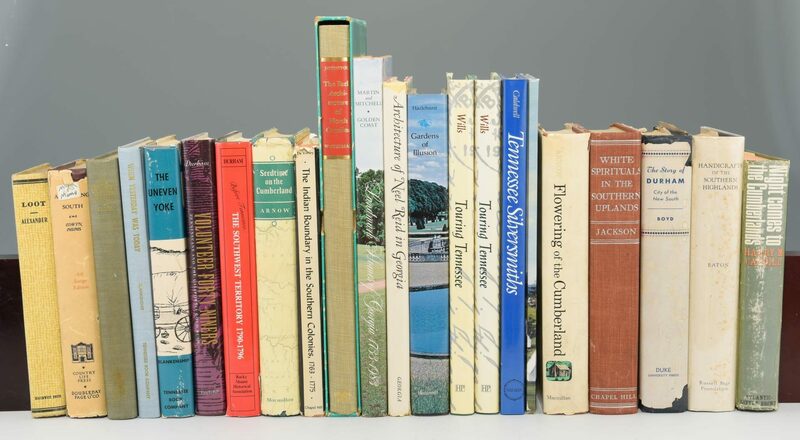 Books range in size from 8 1/4" H x 5 5/8" W x 1 1/4" D to 13 3/8" H x 10 1/4" W x 1 1/8" D. Collection of Charles and Ann Wells, Nashville, Tennessee. CONDITION: Books vary in condition from good to very good condition.